Another autumn arrives in New York with all the majesty and rich palette of changing colors and leaf fall and with it another fall migration. Bird watchers (and writers) entranced by the seasonal avian journey find skies full of winged travelers for glorious study. Birds flying south for warmer climates let us know that at least someone gets to get away for the winter, or so we think. For the birds, navigating through this city means that some make it and some will not make it out of here alive. For all of wildlife, the number one human related threat is habitat loss or destruction. For birds, the second greatest danger is "window kills" or colliding with window panes. As biologist, Daniel Klem, Jr. notes: "birds behave as if clear and reflective panes are invisible to them, and they kill or injure themselves attempting to reach habitat seen through or reflected in windows." Actual figures of birds killed every year in the US as a result of these collisions are unknown but Klem estimates them at 100 million to 1 billion with the modest assumption "that one bird is killed per building per year." When it comes to dangers to birds, window-kills are not well publicized and are often overlooked despite their staggering numbers. Klem compares figures of other sources of "human associated" bird deaths: "120 million from hunting, 60 million from vehicle road kills, 10,000 to 40,000 from wind turbine strikes" per year, concluding that "The kills at clear and reflective glass and plastic are surely in the billions worldwide." These sobering numbers highlight a need to raise awareness of a monumental conservation crisis for our birds and to adequately address it. How birds see, what, when and where they are seeing contribute to the danger. A NYC Audubon study done in 2009 collected data on 5,400 bird collisions in Manhattan over a ten year period. Focusing on factors associated with window collisions, the study found that most victims (two thirds of the collisions resulted in fatalities) were migrating birds from the warbler, thrush and sparrow families. Bird strikes were also found to occur more frequently along "portions of the exterior glass surface that reflect outside vegetation." The study further found that collisions were more like to happen during daylight hours as opposed to evening. The Audubon study concluded that that migrating birds are more at risk of window kills while Klem notes that the more birds around glass the more collisions, with our own misplaced bird feeders being just as likely, if not more so, to place birds at peril. Both statements are no doubt correct as long as glass is present for birds to fly into. Our human disconnect with failing to appreciate the severity of how dangerous navigating the built environment is for birds may result from our failing to adequately contemplate how very differently birds perceive the world. Birds like humans rely on vision as their primary sense and while bird vision is extraordinary compared to human vision in some respects it is markedly different in how birds process visual information-from the rate at which their brains perceive and process information, to the spectrum of ultraviolet light they are aware of. Structural differences in anatomy add to differences in perception. Avian expert, Graham Martin succinctly compares human vision to bird vision: "The human visual world is "in front" and humans move "into" it" and "The avian world is "around" and birds move "through" it." For a bird, with eyes on either side of the head, the field of vision is mostly along the side or lateral with visual coverage above and behind the head. Frontal vision is employed for specialized tasks, beak control, chick feeding, nest construction and targeting an object right before capture. There is a blind area directly in front of the bill and a limited binocular forward field, this forward field is the bird's peripheral vision. Physical evidence of window-kills may not always be readily apparent. Predators and scavengers remove fallen birds and in heavily urbanized areas the task can simply become more debris removal. The NYC Audubon study made note that the collision count was "underestimated" due to "removal bias" which includes building maintenance staff and street sweepers in addition to animal forces. The most fortunate near casualties are those who can recover on their own or who are found by wildlife rehabilitators who will care for injured animals. In the metropolitan area the number of licensed wildlife rehabilitators is limited even as the numbers of wounded birds are overwhelming. A recent look at two websites listing licensed wildlife rehabilitators, nyswrc.org and wildliferehabinfo.org showed each listing four licensed rehabilitators for New York City. On one site, two of the rehabbers listed worked exclusively with turtles, on the other site two of the rehabbers listed worked exclusively with squirrels with two remaining working only with non-migratory birds. Wild bird care, for all birds, became available in 2012 at The Wild Bird Fund, a dedicated center in Manhattan. Rita McMahon, a wild bird rehab expert, who began treating injured birds in her home in 2001, founded the center. For any wild animal a captive stay at any facility is a stressful stay in a foreign environment. Emergency care which may include medication and hand feeding is mainly supportive (providing food, shelter and resting space). While rehabilitation efforts are necessary for healing, McMahon concedes that "everything" in the rehab process is stressful for birds with each bird having no doubt a family, friends and a destination to get back to. Mandatory solitary recuperation without affiliates is stressful for birds who heavily depend on flock and social structure as mainstays for survival. Half of the birds that come to the center recover and once able to demonstrate sustained flight are released. A typical stay is 1 to 2 days. Head trauma, most likely induced by collisions, afflicted most of the migratory birds I saw when I visited the center recently. Among the victims were an ovenbird, Northern Parula, two different types of warbler (morning and black and white), a Red-eyed Vireo, and a Scarlet Tanager. Sparrows, gulls, doves and a swan were also being treated for broken wings, poisonings and a host of other maladies. On any given day the species can vary with pigeons being treated at the center in the greatest number (it is New York). 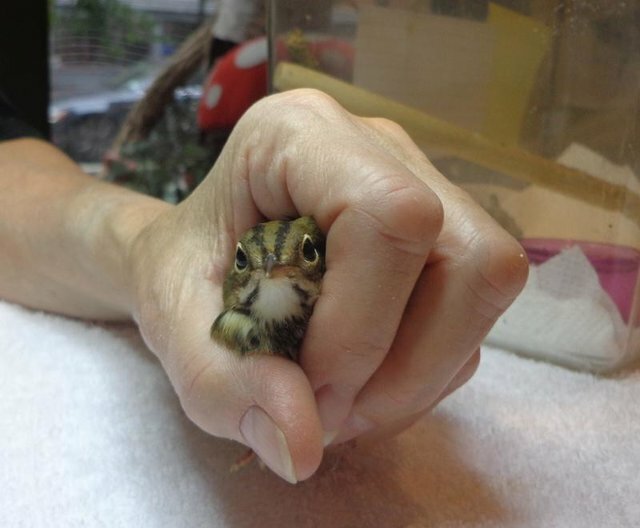 The Wild Bird Fund treated over 1,500 injured animals in 2012 and expects the number to exceed 3,000 this year relying mainly on donations and volunteer efforts. The numbers of birds and the variety of species cared for at the Wild Bird Fund reflect the everyday jeopardies faced by wild animals in our built environment. New York City is located in a major flyway or highway for migratory birds (add to that the native species and the numbers increase to more than 370 species passing through or making their home in the area). When asked in an email exchange, about the ratio of migratory birds compared to native birds typically treated, McMahon wrote: "It's the migratory birds who suffer most from window strikes. We have 12 to 20 at a time in recovery. During fall migration, many to most of them are first-year birds who have not traveled through NYC before. For example, we have 8 yellow-bellied sapsuckers right now, 6 of them are first-year birds." In response to human-associated dangers to native wild birds McMahon writes: "Though some resident birds strike windows, more fall victim to deadly run-ins with vehicles: cars, trucks and bicycles. The greatest number of collisions with vehicles occur with birds that live on the street: gulls and pigeons. Avian diseases take their toll in great measure as well. After that it is predation by pets: dogs and cats. In the urban environment great numbers of birds fall prey to pollution and getting entangled in trash. Many pigeons and waterbirds suffer from lead poisoning and a surprising number of birds are entangled by human hair, from songbird babies in the nest to pigeons on the street. Natural (non-pet) predation accounts for less than 10%." Keeping birds out of emergency care is a far more daunting proposition. We cannot know what birds are looking at while they are flying but employing their side vision to see other birds or predators is probable as is looking for food or habitat. And even if birds were able to look ahead for obstacles would they be able to slow down to avoid them? The answer is most likely that they cannot slow down due to flight mechanics. Many birds cannot see ahead of them with peripheral frontal vision lacking the high resolution their side vision offers. Human oriented solutions to bird collisions often assume that birds are looking ahead and can effectively respond to obstacles in their flight paths. How birds navigate flight tells a different story and requires rethinking from a bird point of view. Avoiding collisions for birds requires a warning system such as our own "slow down hazard ahead" road signs but needs to be avian friendly and meaningful to birds in order to be effective. Graham Martin suggests a system that would warn the birds well in advance of the obstacle in order to "prime attention" with things that are much larger than we might believe necessary in order to register visually for birds and not be fixed in space rather be mobile and or able to divert or distract from their flight path. Such warning systems require the creativity of an informed avian themed perspective along with installation and acceptance in the human landscape. McMahon's observation and data on the proportion of younger birds being susceptible to collisions is a rich area for further investigation and study. Are older birds learning to avoid windows? And if older birds have learned to somehow circumvent windows how did they put the puzzle into place to avoid them and what can we do to enhance the process and better understand how to help? For an immediate remedy, Klem advocates protective measures which include screening windows and placing bird feeders as close to windows as possible to lessen impact. Protective decals are popular but are only effective as long as they are in sufficient number. Another popular treatment is ultraviolet window marking; while a study released this month by Swedish researchers found that this may only be of use for those birds which are ultra violet light sensitive such as gulls, parrots and certain perching birds but not for most other birds which are violet light sensitive. And for right now in NYC there are those volunteers working at the Wild Bird Fund with whichever of the latest lucky victims which might get to get home after all. Maybe.